The final instructions can be seen on the info board of the competition center on the competition days. The competition will take place following the competition rules of the Finnish Orienteering Federation and the rules of the organizers. Spike shoes are forbidden, dobb shoes for orientering are allowed. On Saturday all of the parking will be at close proximity to the competition centre, the longest walking distance being 1,5km. There is hard ground on the parking area. On Sunday some cars will be parked at the other side of highway 8 as well, at the Roukkuli industrial area. The longest walking distance to the competition centre is 1,8km on Sunday. You must follow the parking instructions given by the organizers! It is strictly forbidden to stop or park on highway 8! Parking tickets (5€) are sold at the info in the competition center. Parking tickets will be checked on the way out from the parking area. Take good care of your parking ticket, it is valid on both days. The payment is collected to cover the fees from the parking arrangements. It is advisable to have many people in one car! The competition area is varied and quick to run on, typical southwestern terrain. There are many quite small, open, fast and easy to read bare-rock hills, and these are surrounded by marsh ground or dense forest and felled areas of different age. There are some forest roads, fields and an electric line running through the terrain. House yards and cultivated fields are forbidden areas. There are also some separate forbidden areas that are marked to the map and/or in the terrain. Some dangerously high cliffs have been marked with a plastic band for forbidden areas. Entering forbidden areas will result in disqualification of the competitor. The competition area can only be entered during one’s personal competition. There is a crossing area in one of the cultivated fields, please look at the map below. Remember that elsewhere but in the crossing area the cultivated field is forbidden. Orienteering map, scale 1:10 000, contour interval of 5 m. Terrain planning by Ari Salonen, 2016 and 2017. Printing 4/2017. The size of the map is A4 or A5. The map is in a plastic case. Control descriptions have been printed on the map, there are no separate control descriptions available. Make sure you take the correct map. The officials have spare maps, in case the correct map has been taken by someone else. A model map can be seen at the changeover area. The control points look the same as the model control point in the competition center. Emit card punching system is used in the competition. The control code for some control points differs from the Emit code of the control point punch. That is, the Emit card display number differs from the control code. A changeover and finishing line punching is in use in the competition. The last control is the same for all competitors. There are several punching units at the last control; one punching unit has the RR-code and the rest have number codes. You can punch at any of the punching units of the correct last control. There is a marked route from the last control to the finish line and this route must be followed. There is a changeover/finish punching at the finish line. The running orders for the relay teams must be presented primarily online on IRMA–service by 18:00 on Friday, April 21st. If this is not possible, you can present the running order through email to address finnspring(at)msparma.fi by 22:00 on Thursday, April 20th. Changes in the running order presented thereafter are charged 10 euros/ team. Number bibs are used by all classes. Number bibs are available at the info in the competition center by clubs. You are not allowed to remove the bar code from the number bib and the bar code must be visible once the competitor enters the changeover area. Own safety pins. Emit control slips are available in the changeover area. All classes wear yellow based numbers on the last leg. The entrance to the start and the changeover zone is opened at 11:30. The Emit card is directed to the competitor by the bar code found in the number on the chest. This takes place in the Emit check-in point. Reserve enough time for the check-in. Each Emit card can only be used once during the competition and only in one leg. After the Emit card check there is card reset. Move to the start area in time. There is a toilet at the warm-up area. The competitors are not allowed to use spike shoes. Dobb shoes are allowed. All classes have three legs. The start and the warm-up area are entered as shown by the guidance through the Emit check-in point, which is situated next to the finish line. At the start area the competitors must follow the instructions given by the start officials and the announcer. The runners move to the position shown by their number bib about 4 minutes before starting time, which is when entrance to the start area is closed. The place for each competitor is shown by a number on the ground. The maps are given to the competitors. As the competitor receives a map from the officials, he/she must make sure that he/she receives the correct map (corresponding to the number bib). It is the competitor’s responsibility to make sure that he/she receives the correct map both at the start and at the changeover. The teams that miss their own starting time receive their maps from the officials after the start signal. The start signal will be fired. The competitor may not move forward from his position or look at the map before the start signal. Teams who make or cause a false start will be disqualified. The changeover time of a runner coming to the changeover is received from the changeover punch at the finishing line. The runner gives out his/her map to the staff immediately after the changeover punch and continues to the map stand. The runner coming to the changeover is responsible for giving the right map to the next leg. Running with a wrong map will lead to disqualification of the team. If the map for the next leg is not in the stand, the in-coming runner must inform the staff about it. In this case the competitor will be given a spare map. Lost time is not compensated. The runner proceeds to the punch control after the exchange. Unclear cases are sorted out at the Wailing Wall. Rental Emit cards must be returned after the finish at the info center. There is a fee of 80 euros for an unreturned Emit card. The competitor coming to the finish runs into the finish line lane. The finish line referee judges the standing at the finishing line. The finish punch is made immediately after crossing the finish line. The competitor gives out the map to the staff and continues to the Emit check station. The finish for relay closes at 16:00. A mass start is arranged if necessary. The normal changeover is stopped 10 minutes before the mass start. There is an announcement about the mass start. Maps are returned by clubs after the mass start at the starting area of the relay. Follow announcements. Orienteering map 04/2017, contour interval of 5 m. The scale is 1:15 000 in elite classes and H/D21A. In all other classes the scale is 1:10 000. Terrain planning by Ari Salonen, 2016 and 2017. Printing 4/2017. The size of the map depending on the competition class is A3, A4 or A5. The map is in a plastic case. A model map can be seen at the start areas. A model control point can be seen by the info pole. An Emit punching system is used during the race. The runner is responsible for the working order of his Emit card and the correct number of his Emit card. The control points look like the model control point by the info pole. The control code for some of the control points differs from the Emit code of the control point punch. This means the display of the Emit card shows a different number from the one at the control point. Rental cards can be collected at the info desk, for the price of 5 €. Rental cards must be returned to the info after the race. If the rental card is not returned, the competitor will be charged 80 €. NOTE 1! Check the functionality of the card in advance at the competition center with the 0 punch. A disfunctional Emit card can be changed at the info center for a fee of 5 €. NOTE 2! The rules of the Finnish Orienteering Federation say: "The competitor is disqualified if he has used an Emit card other than the one presented to the organizer..." Check carefully your Emit number from the start lists. Inaccurate information must be corrected before the competition by e-mail to timo.kokko(at)kokkens.fi by Saturday, April 22nd at 20:00 at the latest. After this date the corrections have to be made on the competition morning at the info desk, 3€/change. There are two last controls in the competition. Classes H/D21E (huippuliiga) have their own last control and other classes have theirs. There are several punching units at the last control; one punching unit has the RR-code and the rest have number codes. You can punch at any of the punching units of the correct last control. There is a marked route from the last control to the finish line and this route must be followed. There is a finish punching at the finish line. In classes H/D21E (huippuliiga) one TV-control is a special handmade object that does not belong to the terrain (marked with x in the map). In the terrain this is a feeding stand. Drink stations are marked on the competition map. In class H21E there are 3 drink stations and in D21E 2 drink stations. The drink available is water. There is a first aid station at the competition center next to the finish. It is possible to contact the first aid station from the starting points and the drink stations. The starting lists can be seen at the result pages of www.finnspring.net, on the result board and at the start areas. The first start on Sunday is in class H21E at 10:00, in class D21E at 12:20 and in other classes at 11:00. You will find the guidance for the starts at the info pole. You are not allowed to stray from the markings. Start 5 (huippuliiga) is at the competition center next to the finish. Classes H/D21E (huippuliiga) have a quarantine zone that must be entered latest at 11:40. Runners for all the classes wear number bibs that are obtainable at the competition center, next to the info. There are extra number bibs in the info, as well as the number bibs of those competitors whose entrance fees have not been covered. Take along your own safety pins. The number bib must not be folded. The number bibs of the classes H/D21E are at the quarantine zone. The Emit control slips are obtainable at the starting point, as well as separate control descriptions. There are no fixing tools or covers for the control descriptions. In all the maps that have the scale of 1:10 000 the control descriptions have also been printed on the map, and the control codes are next to the control numbers. In the maps with scale 1:15 000 there are no control descriptions in the map and there are no control codes next to the control numbers. In classes H21E and H21EB there are forking routes for competitors at various stages of the race. A competitor running with an unpaired number takes the map and the control description marked with -1 (an extra code at the end of the class code) and a competitor running with a paired number takes the map and the control description marked with -2. (For example, a competitor with number bib 58 would take the map and the control descriptions marked with H21E-2). The competitor is responsible for taking the correct map and the control descriptions. The guidance for the starts begins at the info pole. The starts are 1000-1300 meters to the north of the competition center. You are not allowed to stray from the markings, the surrounding areas are part of the competition terrain. There are toilets at the starts. 1 min proceeding to the maps. The competitor may take hold of the map at the starting moment. Start The competitor takes his/her map and starts the competition. Classes H/D21E have a quarantine zone at the Roukkuli industrial area at the Uunisepät premises, 1400m from the competition centre. There is no marked route to the quarantine zone from the competition centre. Check the area map at the competition’s website or the competition magazine. Some of the parking spots are located close to the quarantine zone, and these parking spots will be filled with cars arriving from the Mynämäki crossing (navigation address Asemantie 1, Mynämäki). The competitors may stay inside in warm premises and there is a toilet as well. The quarantine zone opens at 9:30 and everybody must be at the quarantine zone latest at 11:40. Numbers and gps-vests will not be given out after entrance to the quarantine zone closes. Only the gps-vests are given out at the quarantine zone, the gps-gadget will be slipped into the vest at the start in the competition centre. Pre-start is located at the quarantine zone as well. At the pre-start the competitors will receive separate control descriptions, Emit control slips and a warm-up map. There are no fixing tools or covers for the control descriptions. The competitors will be called to the pre-start 20 minutes before starting time, after which the competitors can start their way towards the start. 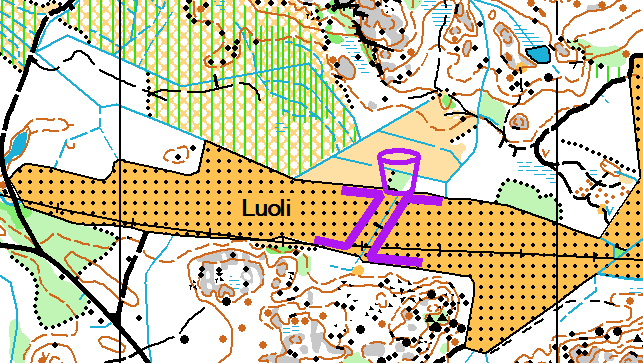 The competitor must stay on the area of the warm-up map on his/her way to the start. It is advisable that the competitor arrives at the start area 5 minutes before the start time. At the start the competitor can see a model map and will receive the gps-gadget. If you miss your own starting time, you must inform the officials at the start about it and you may start your competition as soon as it is possible, considering the stage of the competition at that point. It is forbidden to use the old map of the competition area or a cellphone at the quarantine zone. There is a delivery system for your clothes and belongings from the quarantine zone to the wash-up area. The organizers do not provide any bags or other packing material for the clothes. There is a marked route from the last control point to the finishing line. There is an ONLINE PUNCHING at the finishing line! After punching at the finishing line the competitor continues to the discharge point where the Emit card is checked. Unclear cases are sorted out right away at the Wailing Wall. The competitor will be informed about the result of the extra check at the wailing wall. There is a drinking water point close to the finish. The finishing line closes at 17:00 on Sunday. According to the orienteering rules the competitors are not allowed to show the competition map or the course to other competitors or his/her staff before the last starting time of the last race. Fair play! Competitors who drop out the race must come to the finishing line or let the staff at the finishing line know about it in some other way. Open courses takes place on both days. On Saturday the start for the open courses opens at 12:00 and the finish line closes at 16:00. On Sunday the terrain may be entered at 10:00 and the finish closes at 15:00. There are three different courses available: 2km, 4km and 6km. The courses run at different parts of the terrain on Saturday and Sunday. The fee for the open courses is 12€/day and 20€/Sat + Sun; children under 16 at half the price. Emit punching, rental card costs 5€. A plastic case is included in the price. The sale for the maps happens at the info with cash, the most common payment cards or Smartum notes. The open courses have their own starting point, but the finish is the same as the competitors have. The control descriptions are printed on the maps, no separate descriptions. The start is about 1000m to southwest of the competition center on Saturday and about 600m to the north on Sunday. Open course runners do not have insurance coverage by the organizers. The result board is located at the competition center. The results can also be seen on the organizer’s website. The distribution of prizes takes place according to the directions from the announcers in classes H/D21E, H/D20E, H/D18E and H/D16E. Follow the announcements. All H/D10RR, H/D10, H/D12TR and H/D12 classes’ runners get their prizes immediately after finishing the race. All the other prizes are available after the official results at the info center. The amount of awardees is shown at the result board. The prizes for the relay race are distributed by classes after the official results in classes H/D21A, H/D15-18, H/D10-12TR, H/D12 and H/D14. Follow the announcements. Other classes may receive their prizes at the info, once the results are ready. The amount of awardees is shown on the result board. The toilets are located in the competition center. There is a toilet at the relay’s warm-up area. Washing outdoors. Warm water. The use of shampoo and soap is strictly prohibited. Hot meals, sausages, coffee, filled sandwiches, sweet bread and soft drinks can be purchased on both days. Payments in cash or with the most common payment cards. There are also sports equipment stores in the area. The first aid station is located near the finish line area in the competition center. GOOD LUCK TO THE RACE!